We have made available a significant gamut of Panic Bar Doors for our clients. Conforming to the defined parameters of the industry, these offered doors are appreciated for attributes such as longer serviceability, sturdiness, resistance against corrosion and fine-finish. These offered doors are available with us in different sizes, designs, thickness 1 mm to 3 mm suited to the multifarious requirements of the clients. We are providing our clients with a comprehensive gamut of Steel Doors. These offered doors are manufactured by making use of supreme quality stainless steel and others, procured from the accredited vendors of the industry. Furthermore, these offered doors are loaded with several attributes such as longer serviceability, resistance against corrosion and sturdiness. 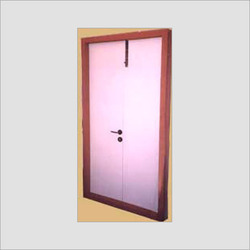 Our clients can avail the offered doors in different sizes, designs, shapes and thickness (1 mm to 3 mm), that can be further customized as per their detailed specifications. Mortar guard & pad plates also available. Available with us is an outstanding gamut of Glazed Doors. Fabricated by making use of supreme quality iron, stainless steel and other required basic material, these offered doors are designed in line with the prevailing fashion trends of the markets. Furthermore, our clients can avail the offered doors available in different sizes, designs, thickness (1 mm to 3 mm), shapes, fittings (aluminum, brass and mild/stainless steel) as per their requirements. 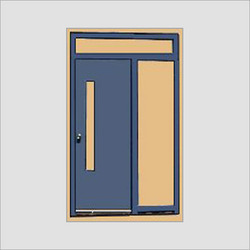 Double Sheet Flush Door made available by usare well recognized for their superior finish quality and are made up of thin sheets of veneer that is pasted over different bases like core of wood, particle board, or fiberboard as per the specific choices of the customers or end application areas these are used in. Here, the veneer faces act as stressed-skin panel and tend to stabilize doors against warping. Further, the face of veneer can also be offered in ungraded hardwood which is suitable for providing plain finish as well as make use of selected hardwood so as to deliver in the doors a natural finish. As these doors are not wrapped, the stability here is provided through stressed-skin panel. 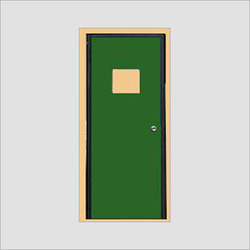 Single Sheet Flush Door offered by us comprise PVC skin mounted on single side and is made available in different finish patterns so as to match up with the specific demands of the customers. Available in decorative wood finish, there are many finish patterns available as per specific style required by the customers. Further, these flush doors are also made available with filling of polyurethane material. 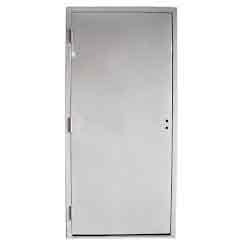 These galvanized flush doors are made available with capacity to withstand high heat and is best recognized for different surface finishes. Double Shutter Flush Door being offered is a quality product and is manufactured from selected seasoned hard wood timber where each of the timber piece used comes treated with preservatives so as to provide long tasting durability. Further, the block board core comes with front of seasoned hardwood battens that are pressed at high temperatures and pressure under cross-band process using phenol formaldehyde resin so as to deliver durable finish to the doors. Further, as these are manufactured from selected seasoned hard wood timber, every timber piece is treated with preservatives so as to provide in it long tasting durability. 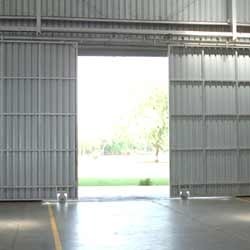 We hold expertise in designing and developing a commendable gamut of Steel Sliding Doors. Doors that we offer are fabricated by making use of high quality MS/GI sheets, procured from our reliable vendors of the industry. Furthermore, these offered hold several attributes such as longer resistance against corrosion, serviceability, sturdiness and dimensional accuracy. 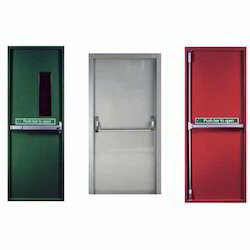 These doors can be motorized and avail with cladding. 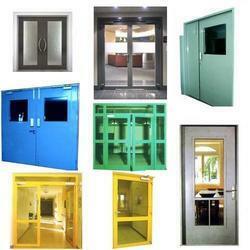 Our valued clients can avail the offered doors in different sizes and thickness as per their requirements. 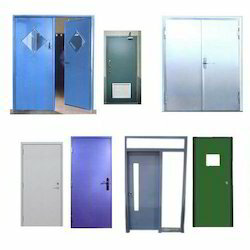 We have made available a significant gamut of Pressed Steel Door for our clients. Conforming to the defined parameters of the industry, these offered doors are appreciated for attributes such as longer serviceability, sturdiness, resistance against corrosion and fine-finish. These offered doors are available with us in different sizes, designs, thickness 1 mm to 3 mm suited to the multifarious requirements of the clients.